KPMG operates as a global network of independent member firms offering audit, tax and advisory services;working closely with clients, helping them to mitigate risks and grasp opportunities.We have more than 174,000 outstanding professionals working together to deliver value in 155 countries. KPMG has been present in Kuwait for over 20 years, and currently operates through its member firms KPMG SafiAl-Mutawa & Partners and KPMG Advisory W.L.L. Our clients include corporations, governments, public sector agencies and not-for-profit organizations. They lookto KPMG for a consistent standard of service, based on our professional capabilities, industry insight and localknowledge. KPMG in Kuwait is an active participant in the development of an ethical, transparent and competitive businessenvironment. At KPMG we aim to create sustainable, long-term value for our clients, with a balanced mix ofinternational and local expertise, our goal is to Turn Knowledge into Value for your benefit. We aspire to be a good corporate citizen by making a difference to the community in which we operate. 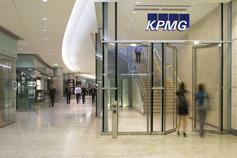 Our peopleembrace KPMG’s values. These values determine how we interact with clients, with each other and with the worldaround us. They define what we stand for and how we act.